UN General Assembly has passed a Palestinian resolution to allow its flag fly in front of the United Nations headquarters in New York, angering Israel and giving hope to Palestinians seeking to gain full UN membership. The vote was passed with 119 votes out of 193 in favor. Among the European countries that voted ‘yes’ were France, Russia, Sweden, Italy, Spain, Ireland, Slovenia, Luxembourg, Belgium, Malta and Poland. The majority of EU member states were among the 45 countries that chose to abstain. A total of eight countries voted against the idea, including the US and Israel. Palestinian Prime Minister Rami Hamdallah told reporters that he strongly believes this marks another step towards recognition of Palestinian statehood. Currently, the UN has only one other non-member observer state – the Vatican. The Holy See did not demonstrate any excitement when the idea was first brought up last month, however, and rejected the Palestinians’ original proposal to introduce the resolution as a joint effort, asking the Vatican to co-sponsor the document. The Vatican still remained unsure on Wednesday whether it will be flying its flag next to Palestine’s. Palestinian diplomats would like to see the flag raised on September 30, marking the day when Palestinian President Mahmoud Abbas addressed world leaders at the annual gathering of the UN General Assembly. Israel criticized the UN’s decision, claiming the international body is biased towards Palestinians. “The assembly would vote to declare the Earth is flat if the Palestinians proposed it,” Israel’s UN Ambassador Ron Prosor said. At the same time, US Ambassador Samantha Power expressed concern that flying the flag at the UN will only create more tension between Israelis and Palestinians. 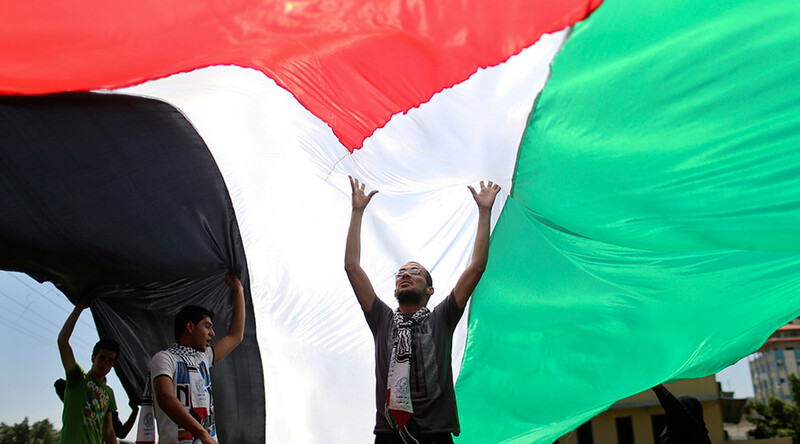 The occupied Palestinian territories have been seeking full independence from Israel for decades, with Palestinians demanding full recognition as a sovereign state from the UN and the international community. At the end of 2014, a bid proposed by the Palestinians’ calling for the creation of a Palestinian state and an end to Israeli “occupation” failed in the UN Security Council after the US used its veto power to kill the measure. The last round of peace talks between the Israeli government and the Palestinians took place between July 2013 and April 2014. Israel halted the negotiations after Fatah, part of the Palestinian Authority, declared peace with Hamas, Israel’s sworn enemy. In a recent statement, Israeli President Reuven Rivlin said that the Israelis have the “right” to build settlements in the West Bank and it is “not a matter of political debate.” His comments are likely to cause controversy, with the EU and Palestine opposed to illegal Israeli development in the area. Settlement building in occupied territories is considered illegal by international bodies. It has also been a major obstacle to peace negotiations. The Palestinians see the West Bank as part of any future independent state. Currently, more than 500,000 Israelis live in West Bank settlements in and around East Jerusalem. All of them have been built since Israel occupied the Palestinian territories in 1967. At the same time, Israel has maintained a blockade of the Gaza Strip since 2007, on the grounds of preventing arms from being delivered to the Hamas militant movement. However, many human rights groups argue that Israel is deliberately trying to hurt the Palestinian population by not allowing humanitarian aid into the Gaza Strip and preventing any kind of sea trade. The latest UN report said that “almost all of the population” is destitute in the Gaza Strip because wars and economic blockades have all but destroyed its entire economy. If the trend continues, the territory may become “unlivable” in five years, a UN conference has warned.